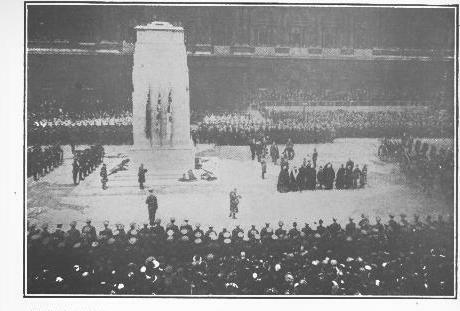 The war brought many a great funeral ceremony to England and France, but the whole world’s history had never witnessed such a funeral as that which each of these two countries held on Nov. 11, 1920. The second anniversary of Armistice Day had come and each nation had elected, as the most solemn consecration for that day, to inter with the highest honors of war the body of an unknown soldier who had fallen on the battlefields of France. The unknown British soldier, to whom these honors were paid in remembrance of Britain’s 700,000 dead, was taken from his burial place in one of the battle sectors of France and transported to Boulogne. All the population of the little seaport town lined the streets to pay France’s tribute as the body was transported from the citadel, where it had lain all night, to the British destroyer Verdun, which carried it to England. All the church bells were tolled, but the flags fluttering at the pinnacle of the masts showed that the occasion was not one of mourning but of glorification. Standing beside the coffin on the quay Marshal Foch, who had made a special pilgrimage to Boulogne as the representative of the French Government, lauded in eloquent words the tremendous effort of the British soldiers who brought to the aid of France their valor, endurance and abnegation. Turning to the bier on which lay the unknown British warrior, the Marshal said: “It is before him that I can best express my profound feelings of thanks and admiration. “French women and children laid wreaths and flowers on the bier while the French troops stood at salute and a military band played the ” Marseillaise.” The coffin was carried on board. Escorted by French and British destroyers, the Verdun then steamed slowly through the thick mist out of the harbor. So the unknown British soldier who had crossed the Channel so full of life and heroic ardor left France forever, long months after he had been plunged into the sleep of the war’s great martyrs beneath French soil. A solemn ceremonial took place at Victoria Station in London, where the bier arrived in the same railway car in which had been transported the last remains of Miss Cavell and Captain Fryatt of glorious memory. Armistice Day dawned. With honors and devotion beyond those paid to Kings, the nameless soldier was buried in Westminster Abbey. The streets of London, from Victoria Station to the Abbey, were black with thousands on thousands of moved spectators. The bier was brought in procession from the station. Covered with its tattered Union Jack, the coffin was borne on the shoulders of ten men and deposited on the gun-carriage which was to bring the body to its last resting place. The guard presented arms. The great personages who to the unknown soldier had been almost legendary figures —Admirals and Generals, six on each side—stood at salute as the bier passed to the black gun-van, which was decorated with palms and purple ribbons “and overflowing with flowers. The cortege started. The horses moved slowly, drawing the van to the station exit, while the deep minor chords of Chopin’s Funeral March resounded solemnly. Up by Constitution Hill, through the long Mall and the Admiralty Arch, then sharply turning off to the right, the cortege passed into Whitehall. Just beyond Downing Street, politically famous, rose against the gray of the sky the flag-swathed cenotaph designed by Sir Edward Lutyens as a permanent memorial. The throng around this cenotaph was like a human sea. All the high dignitaries of the British Government and the British Empire were here to greet the obscure and humble soldier who had paid the supreme price to preserve the world’s liberty. With the King at their head, all turned to face the sable van on which the unknown soldier lay. All the royal family were here, the Cabinet Ministers, members of the first War Cabinet, dignitaries from India and the Dominions. The designer of the great cenotaph stood near in another company of officials. The pavement was bordered with flowers awaiting the unveiling of the cenotaph. The bier advanced to the pulsations of the Dead March in ” Saul.” The pale London sun, glinting on the brass instruments of the marching band, picked out here and there a gleaming sword. The pallbearers, including Admiral Beatty, Marshal French, Lord Haig, General Byng and others of renown, fell into a line at the north. The music stopped. There came a hush. The King stepped forward with a wreath and placed it on the coffin beside the steel helmet. The choir sang a canticle. The Archbishop of Canterbury’s voice rose, reciting the Lord’s Prayer. The King touched a lever; the two great Union Jacks fell apart, settling in two colored masses at the cenotaph’s base. Naked and beautiful, the great shaft of the cenotaph, pale lemon against the sun-shot mist, stood revealed. The silence was broken by the booming of a great bell, while all uncovered. The cortege passed on. Then the official groups broke up and the waiting throngs surged forward to lay their flowers on the cenotaph, which soon was banked with a dense garden of brilliant blooms. Maimed and blinded soldiers passed on in six green motor coaches. Women dressed in black, bearing their tributes to the Abbey, were brought by the police into the main road, which now bloomed whitely with moving flowers against the black streams of humanity in front and behind. The vast and quiet spaces of Westminster Abbey, plunged in a religious gloom shot through by candlelight and gleams from the big stained windows, offered the unknown soldier ultimate repose. The noble lines of the great cathedral swept upward to the dim crown of lights high in the apse. A thousand women in black, a hundred V. C.’s, waited with flowers and wreaths. A bell was tolling softly. There was a vision of color and lights about the high altar. Down the long church stole soft, flute-like music. The choir members, in white and scarlet, moved up the nave into the choir, headed by the dean in his mourning cope. Strangely sweet and wistful sounded their song: O valiant hearts who to your glory came Through dust of conflict and through battle flame! Amidst the solemn harmonies of “Lead, Kindly Light,” the Guardsmen lowered the unknown soldier into the grave prepared for him below the great stone flags. “The night is gone” ended the solemn hymn. The crowd surged forward for one last glance and strewed the purple carpet with white and red flowers. Some of the blackrobed women were weeping. Perhaps that silent, unknown warrior, glorified in death by a whole nation, had been the son of one of them. Who knew? In Westminster the grave of the unknown warrior was left open for one week, and every day an almost continuous line of people filed through the nave to see the coffin that contained the body which had become a memorial to all the British dead. Even when the time came to close the grave on the 18th there were hundreds in line who could not get through. At the very last moment a lady came to the deanery with a maple leaf from Canada, sent by a soldier who had earned the Victoria Cross at Lucknow. She asked that it be placed in the coffin, and her wish was carried out. Then, after a pause for the completion of an organ recital, the grave was filled with soil that had been brought for the purpose from the battlefields of France and Flanders.